Unimpressed though I was with this clunky façade and its kindergarten style lettering, I took a shot and then looked it up on the internet. You must go to this website and read the comments. 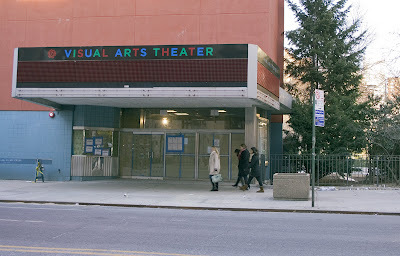 There are people who know everything about this theater, from its beginnings in 1963 as the RKO 23rd Street with a single screen, then to its being used for live theater by the Roundabout Theater in the 70's, then to being acquired by Cineplex Odeon and being triplexed, then to going back to 2 screens and becoming Chelsea West Cinema and now to being acquired by The School of Visual Arts and on its way to becoming a cultural center with state-of-the-art movie capabilities. There are personal memories and lamentings and lists of movies that played there and minute descriptions of lobbies and seats and tales of working for the Roundabout and not getting paid. Anything you'd ever want to know. Wouldn't that be nice? My pet theater is the former Metro Theater but it's too late now to get into that. Note: Apparently Milton Glaser designed the façade. You know, the façade I'm so unimpressed with? Well, I don't care who designed it – I'm not backing down!